Rates include all inn features. The Inn is open from the end of June through the end of September. 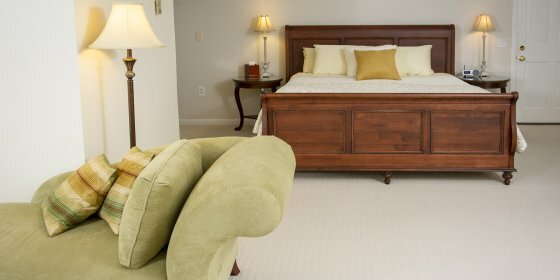 Our largest room features two sitting areas with water views, a king-size sleigh bed, gas fireplace, walk-in closet, and private outside patio. The modern bathroom has a tiled double shower with glass doors. A spacious high-ceilinged room with an impressive four-poster king-size bed, stunning floor to ceiling windows with water views, gas fireplace, walk-in closet, and private outside patio. The modern bathroom has a tiled shower and tub combination with a glass door. A romantic, high-ceilinged room with a king-size sleigh bed, gas fireplace, and private outside deck overlooking the water. Mallard has a spacious modern bathroom with a double tiled shower and a separate two-person whirlpool bathtub. 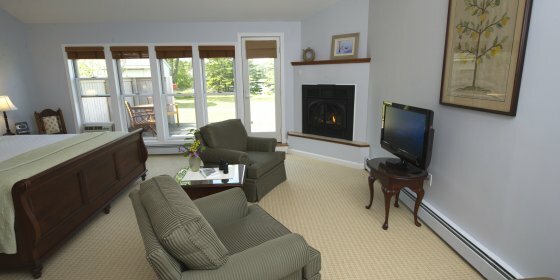 A charming and cozy room with a high ceiling, elegant king-size bed, and a gas fireplace. Osprey has a large modern bathroom with a double tiled shower.